The RLSC has traffic counters at 3 locations in the area. These keep track of when and where our heaviest use is so that we can groom effectively and track trends over time. count was inaccurate due to snow cover!!! NO LAKE IS EVER "SAFE"! Begins at Junction with ITS 84 (Bald Mountain Trail) to local access to Bemis Road area, Toothacher Island and Birches Beach area. Plowed road between R3 and R4. Please watch for vehicles. Up and back trail to summit. Views to the East. Junction is located on ITS 84, South of Rangeley Lake. Good views. 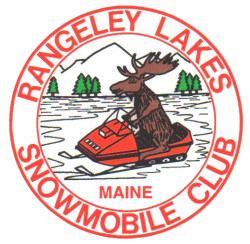 Provides shortest connection between ITS 84 and Connector Trail 117 and Rangeley. Requires a long lake crossing. Not recommended after dark or during snowstorms. Look for a reroute just after you cross Route 16. Use caution: where the reroute rejoins the main trail, the trail is shared use for 400 yards with logging trucks.